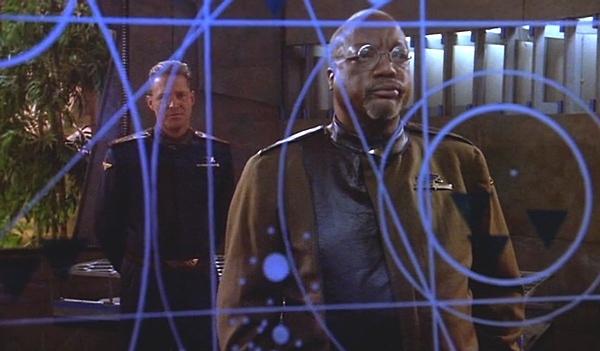 Paul Winfield comes onto the station as General Richard Franklin (no relation to the Doctor Who actor, sorry) and brings 25,000 ground pounders with him as, one episode after the Narn-Centauri war began, our favorite space U.N. quickly takes on a decidedly military tone. Is “GROPOS” underrated? Were you squirming in your seats at Garibaldi and Dodger’s attempted assignation? For God’s sake, what about Keffer? And, for you folks who stick with us into the spoiler section–what is Chip’s greatest fear? That said, I’ve always thought of Garibaldi as being the NCOIC of the station, though I believe he’s actually a warrant officer. Hated Delenn’s attack, so I appreciate your insight into why she might be feeling so vulnerable. and your proposed ending (without the bad CGI) is now my head canon. Reactions and a camera pan totally enough. Because they did a good job of making us care about the characters. Your discussion really helped me appreciate the really good parts of this episode, so thanks!